Mac Heist has just announced that Yep is included in their latest bundle. 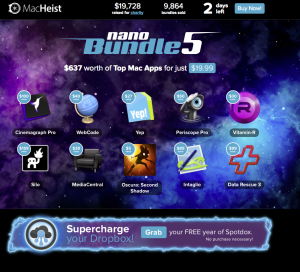 In addition, Spotdox is being given away free by Mac Heist – no purchase required. Just visit Macheist and follow their directions for tweeting about Spotdox and the bundle. Bundles like this provide both sales and marketing exposure for the indep endent developers out there. I bought a copy to get the latest Data Rescue (friends seem to bring me computers once or twice a year with ‘it don’t work and what’s a backup?’). Also high on my list is Periscope, which takes photos with your computer for security, wildlife monitoring, etc. Its $19.99 for over $600 of value, so head over today!